Buying 1/10 oz Gold Eagle Coins is a great way to have highly recognized one tenth ounce gold coins with a small premium over the world’s fluctuating gold spot price. These 1/10 oz gold coins carry legal tender face values of $5 USD yet they are highly traded based on their gold content and overall 1/10 oz gold coin content. The 22k Gold Eagle Coin is the most popular modern gold bullion coin in overall sales volumes and also comes in 1 oz, 1/2 oz, and 1/4 oz, and this smallest 1/10 gold coin size. Authorized by the US Congress by the Bullion Coin Act of 1985, the highly popular Gold American Eagle Coin has been minted by the US Mint since 1986. One tenth ounce Gold American Eagle Coins are minted in 22 karat gold (.9167 fine). This makes these 22k gold coins more durable and resistant to scratching. The 22k gold coin’s troy ounce weight, gold bullion content, and .9167 gold coin purity are all guaranteed by the Government of the United States of America and enforced by the US Secret Service. The 1/10 oz American Gold Eagle Coin’s front or obverse features a throwback to the classic $20 Saint Gaudens gold coin design. This modern gold bullion coin depicts Lady Liberty who holds a torch and an olive branch with the U.S. Capitol Hill in the bottom left background. The one tenth oz gold coin’s year of strike and the word ‘LIBERTY’ is also engraved on the front of this popular gold coin. The 1/10 ounce Gold Eagle Coin’s back or reverse design is by Miley Busiek. Struck on the back of all one tenth ounce Gold Eagle coins is a large male eagle clutching an olive branch flying over a nest containing a female and baby eagle. The fine gold weight of the coin, its legal tender face value, IN GOD WE TRUST and UNITED STATES OF AMERICA are all stamped on the backside of each 1/10 oz American Gold Eagle coin. 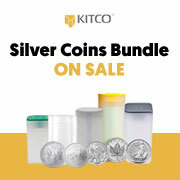 You can store 1/10 oz Gold Eagle Coins safely and securely with Kitco Allocated Storage. Kitco offers you global options for gold bullion storage that is fully segregated, insured and allocated. Kitco Metals’ network of top-tier gold vaults includes some of the most secure gold storage facilities located in Canada, Hong Kong or the United States (COMEX approved). Cayman Islands gold storage is also available (certain conditions apply). Find out more about keeping your gold and physical precious metal purchases secure, with our Global Precious Metals Storage Solutions. The US Mint (United States Mint) was established in 1792, originally located in Philadelphia, the then capital of the USA. Its first Director was the renowned scientist David Rittenhouse. The US Mint was placed under the Treasurer of the United States in 1981. Now headquartered in Washington D.C., the US Mint operates manufacturing facilities in Philadelphia, Denver, San Francisco and West Point and a famed depository at Fort Knox. The US Mint produces all of American legal tender circulation and bullion coins solely for the Treasury's account. Why buy 1/10 oz American Gold Eagle Coins from Kitco? Kitco is a trusted leader in the gold and physical precious metals industry. Gold and other precious metal items sold by Kitco Metals are recognized in bullion markets around the world. With our core focus on gold bullion coins, you benefit from our low gold pricing and premiums that are highly competitive in the gold bullion industry. At Kitco, we strive to make it easy for you to manage your tangible wealth. You can sell or buy gold coins and other precious metals using our convenient online store, or by contacting our team of highly trained precious metals specialists. Backed by our global information network, Kitco has been proudly serving our customers since 1977. The 1/10 oz Gold Eagle Coin(s) you receive may not be in mint condition. The 1/10 oz American Gold Eagle Coin(s) you receive may be from a different years mintage and the appearance may be slightly different from the one illustrated.